One of the strongest defensive lineman draft and free-agent classes of the decade could be just what the 49ers need. Ingram was a game-changer in the Chargers' win in Baltimore, and he'll need to be accounted for in the divisional-round game in Foxborough. The Chargers started seven defensive backs and used that scheme the entire game to stymie the Ravens, who couldn't protect Lamar Jackson. Anthony Lynn said the Chargers this week are taking a "good look" at tight end Hunter Henry, who hasn't played since 2017. 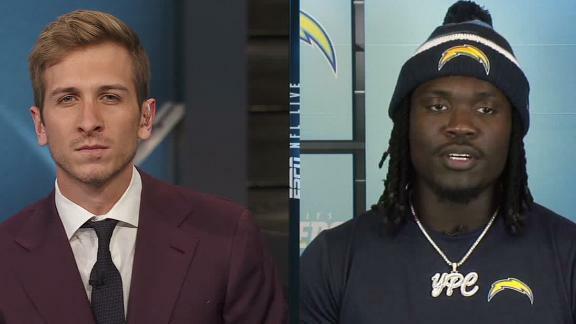 Melvin Ingram has been "invaluable" to the Chargers, playing snaps all over the defensive line and at linebacker. His reward? Another Pro Bowl trip. The loss on Saturday to the Ravens probably cements the Chargers as the AFC's No. 5 seed in the upcoming playoffs. The Ravens and Lamar Jackson believe he's ready to handle a high-ranking defense such as the Chargers, who will try to keep him in the pocket. Can a fully healthy Joey Bosa put Chargers atop the AFC? Joey Bosa missed the Chargers' first nine games with a bruised foot, but after a slow start, he has four sacks in the past three games. Adrian Phillips can play multiple positions, which allows the Chargers to play a speedier personnel group that helps contain potent passing games. Linebacker Jatavis Brown is again among the Chargers' leaders in tackles, but now he's serving as the on-field playcaller for coordinator Gus Bradley. Even during these offense-heavy days, the Chargers and Broncos have found players to terrify opposing QBs. The Chargers have eight sacks in the past two games, and against the Browns it was Joey Bosa's replacement, Damion Square, leading the way. The Raiders fell to 1-4 with a poor showing against the Chargers in which they gave up big plays and looked off kilter in the red zone. Led by a sack and an interception from Melvin Ingram, this was the type of performance the Chargers expected from their defense this season. Defensive tackle Corey Liuget missed the first four games of the season and during that time the Chargers managed only eight sacks. From drafting to stop Von Miller to Andy Reid's offensive evolution, the Chiefs appear to have wrested control away from the Broncos. Thought to be a strength coming into the season, the Chargers' defense has allowed 73 combined points to the Rams' and Chiefs' high-octance offenses. After struggling to rush Chiefs QB Patrick Mahomes, the Chargers found ways to get after Josh Allen to beat the Bills.